Time is valuable, and with our busy lifestyles, free time is hard to come by. 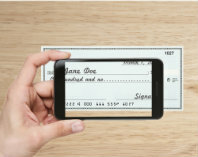 Do yourself a favor and sign up for YourCheck2Go Mobile Check Deposit and deposit checks from your smartphone or mobile device. This means you don't have to rush to the bank before it closes. Deposit checks anytime, anywhere, and if you deposit your check by 5 pm, you will receive same day credit.